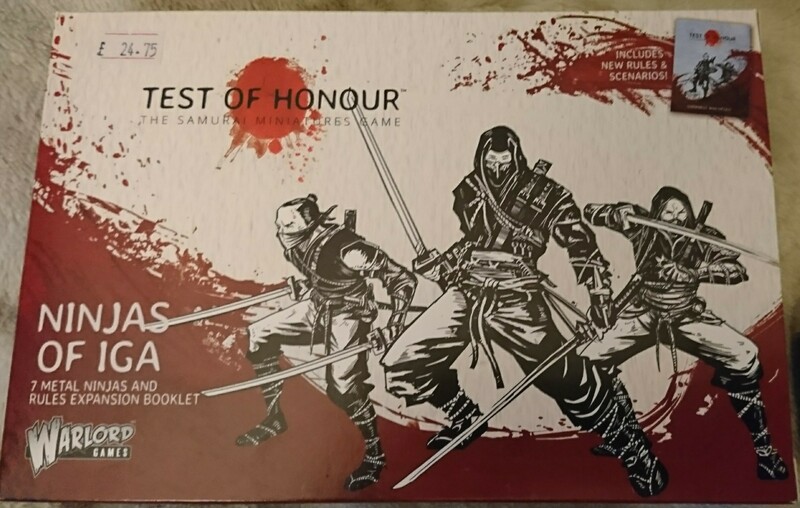 Ninjas of Iga is the latest box set of miniatures to be released by Warlord Games for their Test of Honour Samurai skirmish game – it is the second box set they have released which includes all new metal miniatures. The box set includes 7 metal miniatures, 10 plastic bases and 2 plastic group bases, 18 cards (9 Recruitment cards and 9 Skill cards) and the Darkness and Deceit rulebook. The rule book contains several extra rules, which include darkness and models being unaware of other models presence, as well as rules for lanterns. There are also four additional scenarios: Sudden Attack, Ambush in the Dark, Undercover Raid and Assassination. The Reinforcement cards provided in this box set will actually allow you to play a 24-point Ninja warband with the seven models provided in the box – which makes a nice change as many of the ToH expansion models require additional models. The skill cards revolve around stealth and specialist Ninja weapons (surprise, surprise), which potentially make your Ninja force very challenging to face, although since they are unarmoured, they will tend to get hurt easily – as long as you can see and hit them in the first place. The 7 models are all multi-part metal (no more of those plastic sprues with metal heads), in every case it simply requires the attaching of one or two weapon arms – there is no ability to ‘mix and match’ here – each arm fits a particular model. The joints are well made, and little or no filing is required during assembly. The final models are all very dynamic in pose, and require little clean-up (very light mould lines, and as few small run-offs). The models are armed with a mix of melee weapons, with many traditional ninja weapons including Sai, Tekko-Kagi, Shuriken and Kunai in evidence. These figure have lots of detail, and are very well sculpted. The pack also provides two ‘group’ bases for your warband, should you require them. These models assemble quickly and easily, and are a joy to paint. Whether you want these for a warband in Feudal Japan, or you fancy using them in a more modern setting (as ninja are a classic ‘pulp’ or ‘comic book’ enemy) the Ninjas of Iga are a great set of models to add to your collection. These guys look good but they seem pretty expensive so someone that isn’t likely to play Test of Honour. If you ignore the cards, they work out at around £3.60 a miniature. Yes, that is on the higher end of the price bracket, but it is not unusual for these kind of figures to be priced around £3 – £4 each. The interesting thing is comparing them with similar minis. The Perry Miniatures are 6 for £7, so much cheaper. I am surprised to say that IMO these are much better than the Perrys – better miniatures (far less cleaning up to do) and much more dynamic poses. The difference when these two ranges are put together is quite stark. I was surprised, as Perry Ashigaru and Samurai are some of my favourite miniatures – but I would chose Warlord in this case. Price doesn’t always reflect quality difference, but it does in this case. The price is a bit higher in USD than in pounds but with free shipping. Hmmmm. Thanks for the comparison with the Perry’s since those were the other ninjas I was looking at. Thanks for this review! it really helped me decide to order them. the comparison to perry’s at the end was the cherry on top! I may not end up playing Test of Honour, but with this review I can at least be comfortable in knowing that they are good models to be used else where..